I finally visited the new ice rink in Veterans Plaza yesterday and, while I have a long history of falling down while ice skating, I was excited to see all of the people there, even in yesterday's not-quite-a-snowstorm. Perhaps I'm being stubborn, but what exactly is the difference between ice skating in this space during the winter and skateboarding during the summer? The only one I can see is that the ice skating rink is an organized activity, with set hours and fees and a a contract with an ice rink company that produces money for Montgomery County. I still think the ban on skateboarding in Veterans Plaza and the way it was handled was sloppy at best and quite harmful at worst. 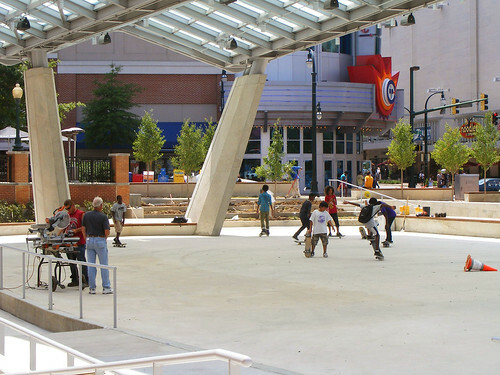 If we can organize ice skating, why can't we organize skateboarding in Veterans Plaza? We charge for people to skate at the Olney Manor Skate Park, so it's not like the county can't make money off of this. Ice skating and non-ice skating aren't that different, but it's surprising that one is socially acceptable and can be done in a public space in the middle of downtown, but the other is wrongly associated with a "bad element" and has to be done in a controlled setting far away from other people. 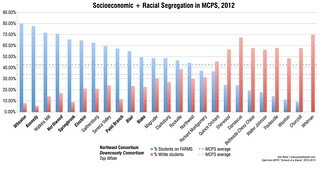 To me, this represents a lack of imagination on the part of our county's leaders. 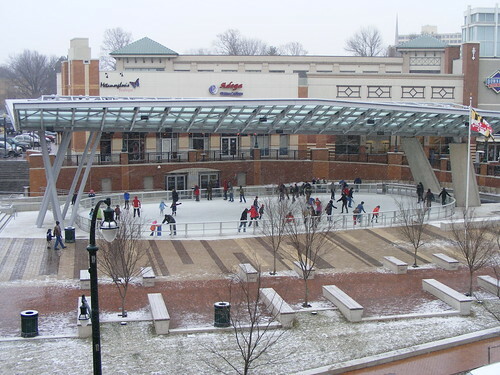 Of course, ice skating is the only thing that will take place in the plaza until next spring, so we have plenty of time to find a way to make this work - or sit on our thumbs and complain when the humble clack-clack of skate trucks returns to downtown Silver Spring once again. By the way, I've found that the website for finding information about the ice rink can be difficult to locate, but easy to remember once you do: It's silverspringiceskating dot com. I think you're making a false equivalency here. The ice skating is more acceptable because it's being done in a controlled, supervised way. I haven't seen anyone propose allowing ice skaters to just zip down any icy street or sidewalk that they please. If you really want to prove your point, though, I think you should organize a band of rouge ice skaters to cause a rukus down town. You're not ignorant, I think you know exactly the differences between ice skating and skateboarding in any given space. And you also know the reasons WHY skateboarding has been banned--for ruining private and public property. It's not like skateboarding hasn't been banned from most private property our entire lives. You're very much aware of it and its effects. If all the skateboarders rode around in circles on specially protected ground material in a little rink all the time, then I'm sure it wouldn't be a problem, but this is how the world works. Sometimes a few bad apples ruin it for the whole lot. Another difference: Skateboarders are primarily teenage boys (Skater Mom being the notable exception, of course), while ice skating is popular with all ages and genders. The juxtaposition of the two photos in the post help illustrate this fact. 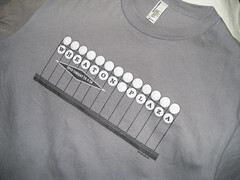 I think Dan Reed's skateboarding advocacy is getting in the way of celebrating an amazing addition to downtown. 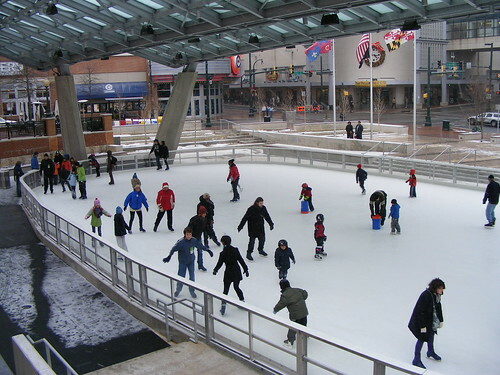 I've been to the rink twice and in the 3 hours total there I saw more ice skaters than I've seen skateboarders in the entire downtown Silver Spring. I don't think I'm exaggerating. There were more people on a small rink at 9:30PM on a Tuesday night than I've seen at a typical open skate session on a Sunday at the Wheaton rink. I asked the workers and they said this was much lighter than it was earlier in the day. The rink is hugely successful and brings far more people to downtown than a skate park possibly could. The idea of turning that area in a pay-to-skateboard park simply doesn't make sense. You'd get nowhere near the volume of this ice rink. As you've said before, skaters need more space so, even at max usage, it wouldn't benefit as much people. Roping off an area for paid skateboarding also means the space isn't available to others when skateboarders are not there (less of an issue in the winter). I agree that they could find a way to allow skateboarding in this area, but the pay-to-skate approach doesn't seem right for this place.